Following the launch of the report at the Peace Palace in The Hague on 16 June, they attended events in New York, Berlin and The Hague, presenting the Report’s findings to key practitioners, policy-makers and academics and discussing how to implement its recommendations between now and the 75th anniversary of the UN in 2020. In New York Professor Gambari, Co-Chair of the Commission and former UN Under-Secretary-General for Political Affairs, gave a major speech at the Business for Peace Annual Meeting at UN headquarters on 23 June. Hosted by the UN Global Compact and attended by UN Deputy Secretary-General Jan Elliason, Professor Gambari outlined the report’s findings on fragile states, climate governance and managing the hyperconnected global economy. In particular, he discussed the important contributions and obligations of businesses to creating the conditions for a more stable peace in conflict affected environments. Professor Gambari’s appearance in New York was preceded by a public panel discussion in Berlin, Germany, which examined the core task of the UN in providing international peace and security. 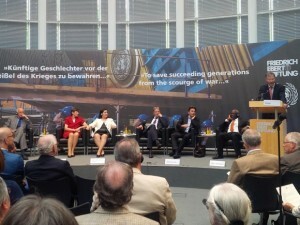 Hosted by Friedrich-Ebert-Stiftung and German UN Association on 17 June, the event saw the former Nigerian Foreign Minister talk about the report’s focus on the intersection of security and justice and the reforms required to prepare the UN and other transnational actors for the challenges of the 21st century. Professor Gambari was once again in action the next morning at an Experts Roundtable on ‘German and European UN Policy for Peace and Security’, where he, Commissioner Ambassador Michael Schaefer and Dr. Richard Ponzio (Project Director for the Commission) further discussed the three critical areas of the report before presenting some of its key findings, including transforming the UN Peacebuilding Commission into a Peacebuilding Council and preparing a new generation of UN peace operations and mediators. Events in Berlin were followed by an ASEAN Roundtable event back at The Hague Institute, which examined ASEAN as a regional organization and its approach to global governance. Here, Dr. Richard Ponzio and Dr. Joris Larik, Senior Researcher, presented an overview of Commission’s findings, focusing on the critical role of regional organizations as promoters of global security and justice. They discussed with assembled delegates, including representatives of all 10 ASEAN member states, giving ASEAN and other regional organizations a more prominent role at the UN in the coming years and increasing the power of regional courts to protect international human rights. These events represent just the start of the work for the Commission and its authors and contributors. Change will not happen overnight, but with hard work, passion and a dedication to take the Report to all corners of the globe, the Commission and its partners looks forward to contributing to a revitalized and strengthened UN and broader system of global governance, better able to tackle the key challenges of the 21st century at the intersection of security and justice.